Born in 1946, James Browning Wyeth came of age when the meaning of patriotism was clouded by the traumas of the Vietnam War and the scandals of Watergate. Working in an era of turmoil and questioning of governmental authority, he did art that encompassed both marching off to war and marching in protest. One of James's early masterworks, Draft Age (1965) depicts a childhood friend as a defiant Vietnam-era teenager resplendent in dark sunglasses and black leather jacket in a suitably insouciant pose. Two years later Wyeth painstakingly composed a haunting, posthumous Portrait of President John F. Kennedy (1967) that seems to catch the martyred Chief Executive in a moment of agonized indecision. As Wyeth Center curator Lauren Raye Smith points out, Wyeth "did not deify the slain president, [but] on the contrary made him seem almost too human." documented by insightful studies in the exhibition - the final, pensive portrait seemed too realistic to family members and friends. "His brother Robert," writes Smith in the exhibition catalogue, "reportedly felt uneasy about this depiction, and said it reminded him of the President during the Bay of Pigs invasion." In spite of these misgivings, James's JFK likeness has been reproduced frequently and is one of the highlights of this show. The poignancy, appeal and perceptiveness of this portrait, painted when the youngest Wyeth was 21 years old, makes one wish he would do more portraits of important public figures. James himself feels he is at his best painting people he knows well, as exemplified by his vibrant Portrait of Jean Kennedy Smith (1972), which captures the vitality of the slain President's handsome sister. He did paint a portrait of Jimmy Carter for the January 1977 man-of-the-year cover of Time magazine, showing the casually dressed President-elect as a straightforward character posed under a flag-draped water tower next to the family peanut plant in Plains, Ga. James recalls that Carter had one Secret Service agent guarding him as he posed outdoors, a far cry from the protection our Chief Executives require today. 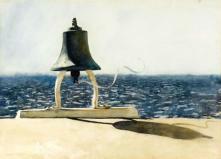 As a participating artist in the "Eyewitness to Space" program organized by the National Aeronautics and Space Administration in collaboration with the National Gallery of Art in the late 1960s, Wyeth deftly recorded in a series of watercolors his eyewitness observations of dramatic spacecraft launchings and more mundane scenes associated with the space program. Commissioned by Harper's Magazine to cover the 1974 congressional hearings and trials of Watergate figures, James Wyeth executed a series of perceptive and now evocative sketches that recall those dark chapters in our history. Memorable images include a scowling John Ehrlichman, a hollow-eyed Bob Haldeman, an owlish Charles Colson, a focused Congressman Peter Rodino, a grim visaged Father/ Congressman Robert Drinan, and vignettes of the press and various courtroom activities. An 11-by-14-inch pencil sketch of the unflappable Judge John Sirica is especially well done. These "images are powerful as historical records," observes Smith, "and as lyrically journalistic impressions of events that changed the nation forever." building hoping to hear the Watergate case, with the ubiquitous TV cameramen looking on, is reminiscent of recent scenes as the high court grappled with the Bush-Gore contest. The Wyeth family penchant for whimsy and enigmatic images is evident in Islanders (1990), showing two of James's friends, wearing goofy hats, sitting on the porch of a small Monhegan Island (Me.) cottage draped with a large American flag. Mixing the serious symbolism of Old Glory with the irreverent appearance of the two men, James has created a puzzling but interesting composition. Painting White House Christmas cards for President and Mrs Ronald Reagan, James first showed the familiar mansion as a homey place, with a single light burning in the Reagans' bedroom on a snowy evening in Christmas at the White House (1981). In 1984, he chose a view with Old Glory flying over a close-up, snowed-in image of the North Portico, in Christmas Morning at the White House. While at work on the official portrait of the White House as part of its bicentennial anniversary, James Wyeth spent a great deal of time on the grounds of the mansion, examining it from all angles and at all hours. "It's just so amazing that this is the home of the leader of the free world," he says, "yet it is really not a large structure. Visitors come expecting to see something on the scale of Versailles, and here is this comparatively small house on the hill, but it is the center of power for this country."